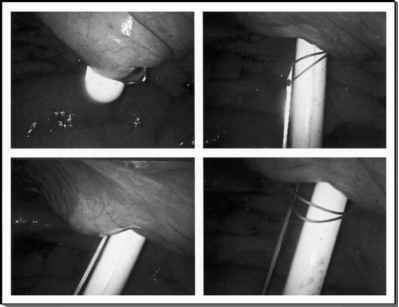 Completion of the posterior wall of the reconfigured bowel segment from an intravesical approach beginning medially and finishing laterally facilitates the best exposure to ensure a watertight anastamosis. is present and potentially prevents an adequate cystostomy incision. Furthermore, adequate exposure for enterovesical anastomosis in all of the procedures described previously is preserved by avoiding a closure of the deep posterior bladder wall incision in the pelvis that will be obscured by bowel and the isolated bowel segment to be used for the augmentation.